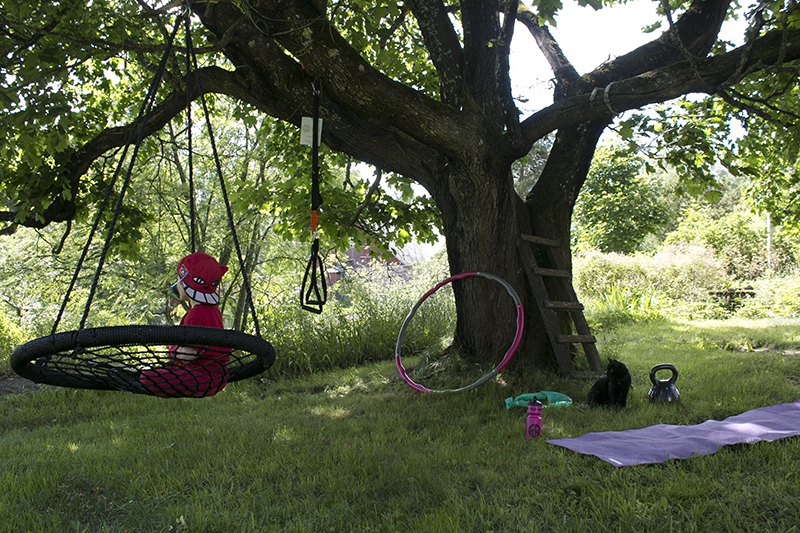 Today I set up a little outdoor "gym" in the garden. Working out outdoors is such a summer bonus, plus when you set up a few different equipments together it becomes more of a thing and you are more likely to do it properly instead of one exercise here and there with some iphone scrolling in between (=how it usually goes when I try do work out at home). That, or making a lists of exercises and reps you are going to do helps me keep focused and not start cheating (too much). I don't have the time to work out as much as I would want to; I almost never make it to the gym anymore, and even though you can do a full body workout at home I don't seem to take the time to do so too often either. Basically you can get your complete work out by doing pilates only, and combining that with dance, for example, you're pretty well off. But I like it with some variation and am rather fond of basic functional gym training as well. And you actually don't need that much equipment for a proper workout as you are able to use your own body as resistance; you can do so much with just your own weight and nothing else. But do I have a set of trx-like straps, some elastics, a couple of dumbells and a hoop. So the routine can be varied a lot. I also took use of Dag's swing for some plank- and push up challenge. After my workout I had some chocolate and red wine to even it out a little.